I suppose by now those that follow this little conversation have noticed that this is just a little larger project than a floor covering change out and a new coat of paint. No, this is an epic spruce-up. Actually a complete house rebuild from the inside out. Difficult? Very – expensive – very. But it’s a hobby, what can I say. I just wanted to finally post what we started with and where we plan to go – so here’s the plan. This is where we started – typical 1930’s home. The previous owners had taken the wall out partially from the kitchen to the dining area and put a peninsula there. The back entrance was typical with a 3′ landing inside the door with a door to the basement and 2 steps up to the kitchen. The central stair area had 4 doors, with a small coat closet. You’ve seen the bathroom renovation on this floor. I removed the coat closet to make a space for the toilet. The porch was poured concrete with lots of wood and foundation problems, as we are posting about now. Here’s where we’re going. The Mudroom and the Sunroom addition form a ‘U’ shaped area for the patio. I’m sure my wife will use the sunroom and patio most of the time. It allows a path from the kitchen to the outside. The sunroom is open to the kitchen which will allow an expanded area for dining with large groups. The kitchen is a type of open galley style with the central island of 14′ with seating at the end. Lots of windows in the house.The wall was removed between the living room and kitchen area to improve the sight lines through the whole space. So now we have the plan, I just have to build it – oh, and don’t forget the upstairs master bedroom and bath. Boy, I gotta get back to work. Till next time. 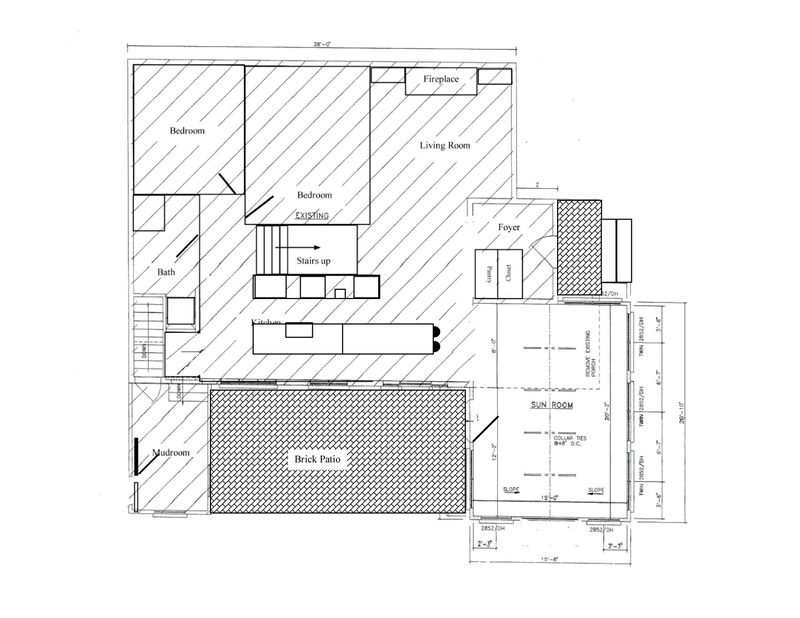 This entry was posted in Mudroom, Room Addition, Sunroom and tagged 1930's bungalow, brick patio, DIY Home, floor plan, Home Renovation, Remodeling by curt. Bookmark the permalink. Good point – but as you know more than most the line between a dream and a nightmare is a fine one indeed. It’s an ambitious plan! But at least it will keep you busy =) Good luck! Hi Kelley – ambitious, you think? But on the bright side – it will keep me busy, as it has for the past four years. Step #1? Now I know what I did wrong. 🙂 I started building this thing years ago and just got around to writing it down. That’s why it’s taking me forever. 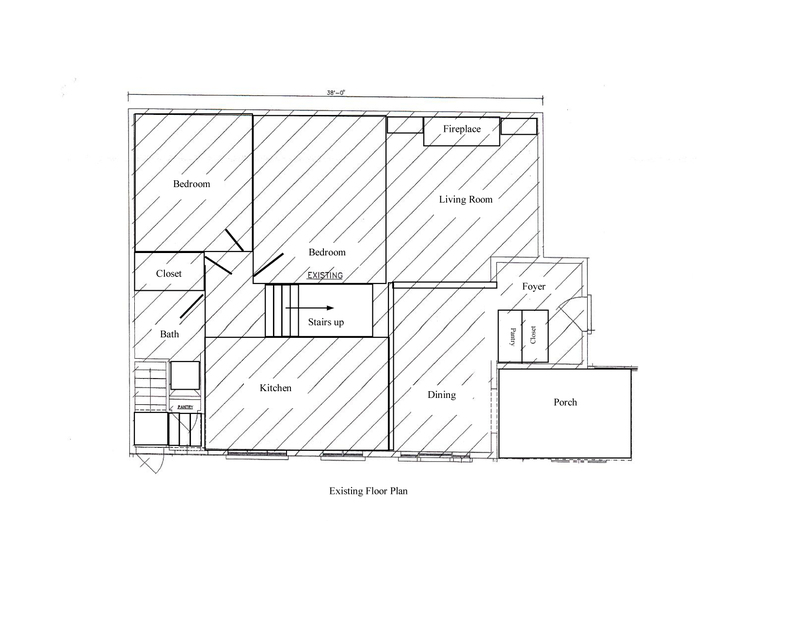 Wonderful, I’ve been meaning to post my floor plan as well, it’s been sitting on my desk top for about a month now, your miles ahead of me! Looks great and from what you’ve already posted it’s going to be an amazing house. Thanks so much. I see you’re way ahead of me in the rock department. I’ve yet to go pick up my 10,000 pounds of limestone. Things are going well – I just hope I’m done before I have to go to the nursing home.